gesteh endlich deine Niederlage ein! um das Recht, nicht zu schlagen. «Воздух»: Журнал поэзии, 2007, № 3. 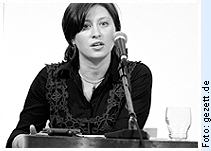 Halyna Kruk (Галина Крук) was born on November 30, 1974 in Lviv, Ukraine. Kruk is a poet, writer of fiction and a researcher of Ukrainian medieval literature. At the age of 22 years she had already won two prestigious literature competitions, the Ptyvitannia Zhyttia (Greeting Life) and Granoslov. In 1997 her first two poetry collections – Mandry u Poshukakh Domu (Journeys in Search of Home) and Slidy na Pisku (Footprints on Sand) –were released and they made her a well-known name in the tradition of Ukrainian women’s poetry. On the whole, Kruk has written three poetry books, been published widely in literary journals and has won two international literary awards. In 2003 she received the Gaude Polonia Fellowship grant presented by the Polish Minister of Culture. Kruk is also known for writing children’s poetry and fiction. In 2003 she won the Step by Step international competition for children’s books. Her Marko mandruje navkolo svitu (Marko Travels Around the World) and Vazhko buty najmenshym (It’s Hard to Be the Youngest) have been translated into 15 languages. Halyna Kruk is a member of the Ukrainian writers’ association and a professor of literary studies at the University of Lviv.